“After all these years as a struggling musician I finally catch a break. But of course it had to be with a band where I wear a mask so nobody recognizes me anyway…”. The words come from one of The Nameless Ghouls in Ghost. Oh, the irony of life, right? Because if there is one band that is – and has been since 2010 – a HUGE hype, and that is meant in a good way by the way, then it’s Ghost. This Swedish ensemble do not need a closer presentation because love them or hate them, everybody know who they are by now. The whole image trip that Ghost are on has really paid off big time. The whole mystery thing, not revealing their true identity is certainly nothing new, Kiss did that in the early seventies, but the fact that that the band has managed to keep their identities a secret for very long is quite impressive in the day and age of internet, where news spread like wildfire. Fact is, as far as I know, none of the Nameless Ghouls has been revealed yet. And even though most people know who play the part of Papa Emeritus, the lead singing evil Pope, people play along with the whole gimmick as if they don’t have a clue who he really is. When you have managed to get your fans to play along like that, you really have a strong fan base. To not become a bore, doing the same thing record after record, Ghost came up with the idea to change the Pope after each album to keep things interesting. That means that we now have Papa Emeritus III, apparently the twin brother of Papa Emeritus II. Same thing there, the fans go along with it, pretending not to grasp that the Pope has been the same guy from day one. I like that, that’s what I call audience participation. Me, I was a bit of late Ghost-bloomer, unfortunately, I have a tendency to become a bit obstinate when bands / artists are being hyped too much. That’s what happened with Ghost. But I was way to curious not to give them listen and when I finally gave in, I realised that their debut Opus Eponymous was a damn good hard rock record. 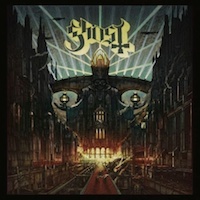 Opinions of Ghost’s second album Infestissumam (2013, reviewed here) has divided many fans in two camps, the ones who loves it and the ones who aren’t that fond of it. I belong in the camp that loves the record. I even find it much better than the debut, so I was expecting a lot from their third release. What is important when you release an album that has split their fans in two camps is to make a record that will gather them all and hopefully make them all dig the new material. So it was with a big anticipation I pushed play for the first time. Now, I saw the band play at Sweden Rock Festival just a few months ago, where they “showcased” three songs from the new album. But listening to a completely new song in a live environment for the first time, it’s not easy to know what to make of it except if you like it right there and then, but it’s really hard to grasp it. I remember liking the songs, but that’s about it. Opening track “Spirit” gushes over me like an evil blanket, the melody is striking and gets stuck in my head right away. Soundwise, I’m getting a Deep Purple / Uriah Heep vibe with some Yes-like pomp rock organ as the icing on the cake. What an opener – I’m floored. Next up is “From The Pinnacle To The Pit”, one of the songs they played at Sweden Rock. I liked it at Sweden Rock and I love it on this record. The groove leans almost a Grunge vibe, but in a more classic Hard Rock way and the keyboard pomp makes me think of early Magnum and even Styx – them boys really know how to mix their influences. “Cirice” was the song at SRF that stood out the most and listening to it now, I totally get why. Yes, the tune is fantastic in itself, but sound turns and twists in an unpredictable way. The intro has a big Opeth vibe while the heavier parts show traces of Slayer and on top of that we get a Thin Lizzy influence in the twin guitar solo. “Spöksonat” (Swedish for “Ghost Sonata”) is a ghostly (what else?) sounding acoustic instrumental that would fit perfectly in a horror movie. “He Is” – of course a tribute to the Dark Lord – is a ballad. That very fact makes the song stand out. The foundation is 70’s Hard Rock and there is some Zeppelin in there, but the there are lots of pop in the melodies and I start to think about both Mike Oldfield and ABBA. But they add some cool Thin Lizzy twin guitars and the whole mix is, of course, brilliant. One of the best songs on the album, doubtless. In “Mummy Dust” they bring out the darkness and heaviness even more. Apart from the classic Ghost melodies, I hear both King Diamond and Alice Cooper and even some Black Metal influences in the lead vocals. The chorus borrows from Opeth’s “The Devil’s Orchard”, but I bet that’s completely unintentional. “Majesty” is a big, quite pompous song that holds some cool influences from early pomp / AOR acts such as Magnum, Yes and Asia, but the base is 70’s Hard Rock in the vein of Deep Purple, Uriah Heep and Blue Öyster Cult. “Absolution” is a pretty straight forward Poprocker, a really catchy tune with a Boston feel mixed with the usual 70’s Hard Rock influences. The closing track, “Deus In Absentia” is, however, best of all. It’s a big, epic rocker that move in AOR territory not very unlike what Kansas used to give us back in the day with a melody so catchy it might even give them a hit. There are some progressive elements in there as well as some early 80’s Melodic Rock such as Foreigner, but the overall sound comes, of course, from the 70’s. The closing choir make the song very satanic sounding as well. To be honest, I was completely floored after just one listen, still the record kept on growing on me. I think Ghost are a band that has developed and moved forward with each album, changing their influences around here and there but never losing the Ghost sound. They did get some criticism for their very obvious Mercyful Fate and Blue Öyster Cult influences on their debut, influences that were toned down for the follow-up. There are snippets of both bands even on this album, but here Papa and his ghouls has been thinking outside of the box and bringing in influences that I never would have guessed they would put into their music. So at the same time as they have turned more melodic, putting some Melodic Rock and AOR influences in there, they are probably heavier than ever on this record. Because there are more influences here to digest: Heavy Metal, Hard Rock, Prog and even Black Metal – all of this makes for a really interesting and enjoyable musical journey through Ghost-land. The production is dark, heavy and mean, but at the same time glossy, smooth and beautiful, but never, ever cheesy or safe. Producer Klas Åhlund (Teddybears) has really managed to give them a perfect sound. But what this album has the most is songs – great songs. Every single tune on this album is a total winner and there is not one single second on Meliora that’s even close to bad – hell, to just call one of the songs “good” feels like a let down, all the songs are way better than good. This is easily the best Ghost album yet and a contender for the Album Of The Year price. I raise just one question: How will they top this next time?